The fully stocked Kitchen features Granite Counter Tops, Stove, Refrigerator, Dishwasher, Microwave, Coffee- maker, Washer/ Dryer. Laminate flooring has been installed in the Kitchen, Living Room and Dining area. The Master Bedroom features a Queen Size Bed with comfortable mattress, wall mounted Flat Screen HD TV, Ceiling Fan and New Air Conditioning Unit, large closet, and sliders to the deck. As Ocean Edge members we are able to offer our sponsored guests access to the amenities the ocean edge has to offer. Walk across the parking lot to the Fletcher indoor/outdoor pools with fitness center. Enjoy Restaurants,Tennis, multiple Pools, Basketball, Volleyball, and Biking on the Cape Cod Bike Trail. Bikes and Paddle Boards are available for Rental at the Ocean Edge. One mile to the closest Bay Beach, with the amazing tidal flats to explore, and only 9 miles to the waves and glorious beaches of the Cape Cod National Seashore. Smoking and pets are not allowed. Linens Not Included. A truly memorable Cape Cod vacation! We thoroughly enjoyed our Cape Cod vacation at your Ocean Edge condo. The condo was very clean when we arrived and had all the amenities we needed. The grounds at Ocean Edge are beautifully landscaped and we enjoyed the views from the balcony. The ocean beaches are only minutes away, where we spent hours swimming, walking, and reading on the beach. In addition to day trips to Nantucket and Provincetown, we also took free tours of the Cape Cod Potato Chip factory and the Cape Cod Brewery. Of course, we also enjoyed several delicious seafood dinners at the nearby restaurants. This was our second year at the condo, and we hope to return again in the future. Thanks for a memorable vacation. My wife and I, and our two kids (4 and 1 year old) visited this lovely condo for 4 nights in late June. First off, the grounds of the Villages at Oceans Edge, which is interlocked with a golf course, is simply beautiful. There is usually an attendant at the entrances to greet cars entering the grounds, which is much appreciated. The condo itself was very nice! You can tell that it was professionally cleaned. The amenities are very nice and it has everything that you need. I slept on the murphy bed, while my wife and 4 year old sleep in the main bed with my 1 year old in a pack-n-play. Our beds were very comfy. There was a TV in each room with more channels than you should be watching while on vacation. After the kids went to bed, we spent some time on the deck, enjoying the summer air. We used the kitchen to make lunches to bring to the beach and have breakfast. Having a dishwasher, washer and dryer, microwave, toaster, oven, ironing board, hair dryer, air conditioning was ideal. While we didn't use the pools, it was nice knowing that they were there (in case it was a rainy day or we needed a break from the beach). I would have loved to go with my son after the beach, in the evenings, but it wasn't worth the cost - seemed expensive for day passes! We didn't eat at any of the resort restaurants, however we did enjoy some local places. El Guapos was great Mexican food and pizza from Brick L'Oven, both approx. 1 mile away, was delicious. I loved that the condo was located in such a nice area and centrally located. While it isn't walking distance to the beach, it is only minutes away by car. Also, both Chatham and Nauset Beach are only about a 10 minute drive away. My 4 year old son loved Nauset Beach the most. Mainly because he loved jumping in and out of the big waves. The water is much colder than the Brewster Beaches. You could literally walk out a mile at low tide at the Brewster Beaches, which is cool to see. My 1 year old loved playing in the tide pools. The water was fun to play in, as it is so shallow and much warmer than the Ocean side of the Cape. My favorite part of Cape Cod was grabbing dinner to go, and eating it on a blanket in the evenings on one of the many beautiful Brewster beaches - Crosby's Landing, Breakwater and Paine's Creek! Shaun and Colleen was great to deal with! Great communication, very responsive! Will definitely be back! This property is "as advertised". It was perfect for a 3 night getaway for my wife and I. The accommodations were comfortable, cozy and clean. The kitchen is well stocked and had everything we needed. Owners were a pleasure to deal with and answered all of our questions. Would definitely stay again. My husband and I spent 4 wonderful and relaxing days. It was perfect in every way. Clean and cozy. It had everything, all the comforts of home. I loved that it even had a extra mirror on a stand in the bathroom. We found it a great location. Kinda in the middle of the cape. This comfortably furnished and nicely decorated one bedroom condo in Ocean Edge Resort proved to be perfect for the two of us. The resort itself is beautiful and has all the amenities once would expect of a 5-star property. We love Brewster as it is on the bay side of Cape Cod and quieter than other locations on the Cape. Also, since Brewster is located mid-Cape, it is the perfect place from which to fan out on day trips without their becoming too exhausting. All-in-all a very relaxing and enjoyable place to soak in the vibe and all that Cape Cod has to offer. We had a great stay at Shaun and Colleen's condo. It was impeccably clean and cozy. They had everything you would need for an enjoyable stay. We will most certainly be returning! beaches, shopping and dinning. Be sure to explore the Cape Cod Bay at low tide with miles of beach activities. Take a short drive to the National Seashore to see the Dunes of the cape. You can access the Cape Cod bike trail with miles of scenic beauty right from the resort. 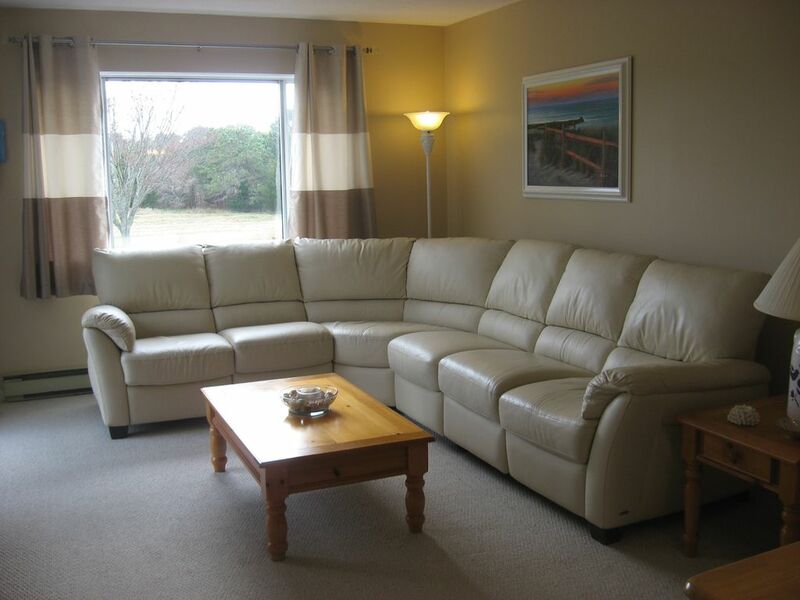 $875 - $1150 Weekly Long term winter rentals considered.